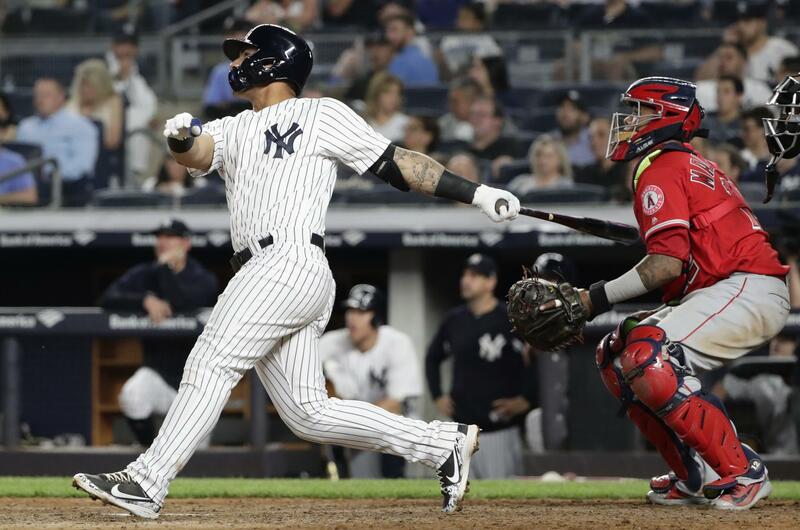 UPDATED: Fri., May 25, 2018, 10:44 p.m.
Gleyber Torres became the youngest American League player to homer in four straight games, Aaron Judge threw out a pair of runners from right field and the New York Yankees beat the Los Angeles Angels 2-1 on Friday night in New York. Shohei Ohtani, the two-way Japanese rookie sensation, came to bat with the potential tying run on base and two outs in the eighth. New York brought in closer Aroldis Chapman to face Ohtani with Justin Upton at first. Chapman threw a wild pitch that advanced the runner, Ohtani sent a 100 mph pitch just foul of the left-field pole, then grounded out on a 101 mph offering. Mike Trout tied the score in the fifth for Los Angeles with his 16th home run. Chad Green (3-0) won in relief of Luis Severino. Chapman, pitching on five days’ rest, got four straight outs for his 10th save in 11 chances, finishing a six-hitter. Rockies 5, Reds 4: Pinch-hitter Noel Cuevas hit a tiebreaking triple in the sixth inning, Jon Gray settled down after a shaky start and Colorado beat Cincinnati to open a long homestand. Nolan Arenado homered early for Colorado in the first of nine in a row at Coors Field. Gray threw 100 pitches over six taxing innings in allowing four runs. Wade Davis struck out two of three in the ninth to earn his major league-leading 18th save. Mariners 2, Twins 1: James Paxton allowing one run in seven innings and struck out 11, and Mitch Haniger’s two-out RBI single in the sixth inning helped lift the Mariners past Minnesota in Seattle. Seattle won its 14th one-run game, thanks largely to another strong performance by Paxton (4-1). The lefty allowed just three hits – two of them to Max Kepler – and didn’t walk a batter. Paxton allowed Kepler’s home run leading off the fifth inning. Edwin Diaz pitched the ninth for his A.L.-leading 18th save. Fernando Romero (2-1) took the loss. Diamondbacks 7, Athletics 1: Patrick Corbin allowed four hits in seven innings and Nick Ahmed homered to help Arizona snap a seven-game losing streak with the victory over the Athletics in Oakland, California. Paul Goldschmidt and John Ryan Murphy drove in two runs apiece for the slumping Diamondbacks, who lost 13 of their previous 14 games and averaged 1.9 runs during that stretch. Corbin (5-1) was the beneficiary of some much-needed offense and ended a streak of five starts without a victory. The left-hander struck out seven and walked one. Mark Canha homered for Oakland but Sean Manaea (5-5) struggled for a fifth consecutive start, sending the A’s to their sixth loss in seven home games. Dodgers 4, Padres 1: Matt Kemp slugged a three-run homer in the first inning, Enrique Hernandez added a solo shot in the third and the Dodgers beat San Diego in Los Angeles in a matchup of the two worst teams in the N.L. West. The Dodgers won their third in a row and seventh in their last eight while improving to 11-14 at home. They are next-to-last in the division. Lodged in the cellar, the Padres are 4-4 in their last eight. Rangers 8, Royals 4: Ronald Guzman homered in his fourth straight start and drove in three runs, leading Texas past Kansas City in Arlington, Texas. The rookie first baseman hit his sixth home run of the season. Guzman started three games against the New York Yankees earlier this week and homered in each, but struck out as a pinch-hitter against the Royals on Thursday night. Nomar Mazara also had a homer and three RBIs for Texas. Red Sox 6, Braves 2: Mookie Betts hit his major league-leading 17th home run, J.D. Martinez slugged his 16th and the Red Sox beat Atlanta in Boston. Boston got its fifth win in six games shortly after designating Hanley Ramirez for assignment. The move freed up a roster spot for Dustin Pedroia to be activated from the DL, and also created the chance for regular playing time at first base for Mitch Moreland, who had a solo homer in the eighth. Orioles 2, Rays 0: David Hess pitched four-hit ball into the seventh inning, helping Baltimore overcome a strong effort from Tampa Bay’s bullpen, defeating the Rays in St. Petersburg, Florida. Danny Valencia doubled in a run off starter Sergio Romo, and Jonathan Schoop went deep against Ryan Yarbrough, spoiling a an impressive opener for the Rays’ relievers as the team plans to use bullpen days in all three games this weekend. Yarbrough replaced Romo (1-1) after two outs and struck out eight over seven innings, tying a franchise record for strikeouts by a relief pitcher. Hess walked three and struck out three. Both of his wins have come against Tampa Bay. Brad Brach pitched the ninth for his seventh save. Astros 11, Indians 2: Jose Altuve tied it in the eighth inning with a two-run double off Andrew Miller and then scored the go-ahead run on Marwin Gonzalez’s squeeze bunt, and Houston scored all 11 runs in the final two innings to rout the Indians in Cleveland. Houston scored three runs off Miller during a four-run eighth before George Springer’s three-run homer helped make it a blowout in the ninth. Springer’s homer off Josh Tomlin highlighted the ninth, when the Astros sent 10 batters to the plate. Houston has won 13 of 16 and is 4-1 against Cleveland this season. Joe Smith recorded the final out in the seventh. Blue Jays 6, Phillies 5: Justin Smoak homered, Sam Gaviglio struck out six over six innings and Ryan Tepera escaped a ninth-inning jam for his first save to lead visiting Toronto past Philadelphia. Gaviglio (2-0) won for the second time in place of injured starter Marcus Stroman (right shoulder fatigue), allowing three runs on three hits – including the first career homer by Phillies starter Zach Eflin (1-1). Carlos Santana also homered for Philadelphia. Pirates 8, Cardinals 1: Joe Musgrove came off the disabled list to win his Pittsburgh debut with seven scoreless innings as the Pirates defeated St. Louis in Pittsburegh. Musgrove also had his first career hit and scored the winning run. The right-hander singled to lead off the sixth inning, when the Pirates scored three times off John Gant (1-2) to break a scoreless tie. Musgrove came home on Josh Harrison’s double. Musgrove (1-0) allowed five hits and struck out seven. He was activated before the game after being sidelined all season with a strained right shoulder. He was acquired from Houston in January. Francisco Cervelli had a three-run double in the seventh to make it 6-0. Tommy Pham homered for the Cardinals. Cubs 6, Giants 2: Kyle Hendricks limited visiting San Francisco to one run and two hits over seven innings, and Ben Zobrist lined a tiebreaking two-run double in the seventh for Chicago. Hendricks (4-3) struck out seven and walked two. The Cubs scored four in the seventh while chasing Derek Holland (2-6) to grab a 5-1 lead. Gorkys Hernandez had two of San Francisco’s four hits – a leadoff homer in the fourth and a single in the sixth. Nationals 9, Marlins 5: Max Scherzer was twice unable to hold a two-run lead and won anyway when Washington’s bullpen locked down the Marlins in Miami. Michael A. Taylor and Matt Adams each hit a two-run homer for the Nationals, and Bryce Harper’s two-run double in the seventh broke it open. Scherzer (8-1) labored through six innings, allowing seven hits and four earned runs, both season highs. White Sox 5, Tigers 4: Jeimer Candelario had a go-ahead RBI bloop single during a three-run eighth inning and the Tigers rallied past Chicago in Detroit. Candelario was reinstated from the disabled list before the game. He dropped in what initially looked like a routine popup over first baseman Jose Abreu’s back shoulder, allowing Nicholas Castellanos to score from third and giving the Tigers their first lead of the night. Reliever Buck Farmer (1-3) pitched a scoreless eighth inning and got the win. Shane Greene retired the side in the ninth for his 12th save. Former Tigers pitcher Bruce Rondon (2-3) took the loss. Brewers 4, Mets 3 (10): A.J. Ramos walked consecutive batters to force in the winning run with two outs in the 10th inning, handing the Brewers the victory over New York in Milwaukee. Ramos relieved Jerry Blevins with runners at first and third, walked Hernan Perez on four pitches then skipped his 3-1 pitch to Travis Shaw to end it. That scored Eric Sogard, who singled with one out off Robert Gsellman to spark the rally and snap an 0-for-28 skid. Published: May 25, 2018, 10:44 p.m. Updated: May 25, 2018, 10:44 p.m.